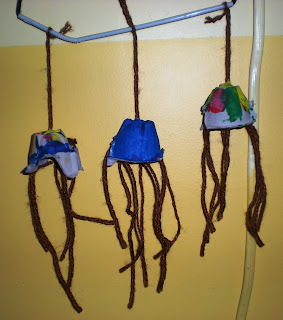 I was making these jellyfish and didn't really know what a group of jellyfish are called. I found the answer over at yahoo answers. It said they are called a "smack","brood", "smuth", "smuck", or "fluther." You learn something new everyday. 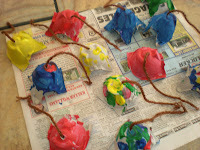 Don' t forget the jellyfish fingerplay with this craft. First cut the egg carton into 12 individual cups. Let the children paint the cups as they wish. One color, two colors, dots, stripes, pinwheels, etc., just let them have fun with it. 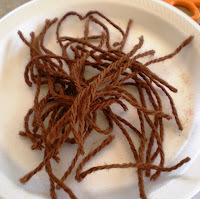 Next cut some ribbon or yarn into pieces for tentacles. The great thing here; the pieces don't have to be any specific lengths. They can also be all kinds of different lengths. Let the children cut the yarn or ribbon--have a ball. 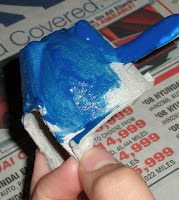 The next part I did. I poked a very small hole in the top of the cup, tied a knot in one end of the yarn, and pulled it through the hole. I used this piece for hanging. Let the children dab some dots of glue around the inside of the cup--as many or as few as they wish. Then add the the ribbon or yarn for tentacles. I used tacky. For the most part your done. (I thought they looked like spiders) I took it a little further though. I got a straw and strung a shoe lace through the straw. I then hung three jellyfish on the straw, sort of like a mobile. 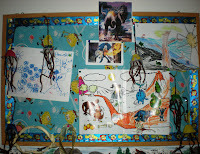 The other jellyfish were added to my son's bulletin board. I just put a tack through the hanging piece of yarn. They are a bit hard to see because he wanted a Spongebob themed bulletin board so it's a bit busy. But, doesn't Spongebob just love his jellyfish? I hope you all have a wonderful week. I will be without the internet for a while. I am actually looking forward to a bit of downtime. Take care and enjoy! These look great! 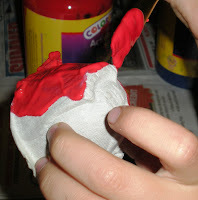 We've made similar ones with coffee filters and tissue paper streamers, and they are so much fun to make. Great idea to use the egg carton! great! cool, frugal and fun! This looks like fun. I am adding this craft to my "easy projects" folder. Enjoy your vacations! Interesting! You do learn something new everyday. 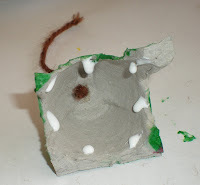 Cute projects. Enjoy your break from technology!! That is so funny! We just made a jelly fish today! I'll be posting picts on Monday. I didn't know about the smack! I posted our version today! I linked to your post. :-) Have a great day!